SUNRISE, Fla. -- Perhaps Dougie Hamilton owes Tyler Seguin a phone call. One imagines the Dallas Stars center might have some sage advice on how to handle the door slamming you on the backside as a bus rolls over you, which is what happened when the Boston Bruins traded Seguin in 2013. The tales of partying, criticism of his work ethic and other forms of character assassination sprung forth from unnamed sources and were passed along in the media. Hell, even a Fourth of July party he had on the day of his trade was scrutinized. How dare you have a party on the day everyone has a party! Anyway, Hamilton was traded by the Bruins on Friday, and his sins are far worse: He actually wanted a contract that mirrored his value as a restricted free agent defenseman; and the price, and the fear of an offer sheet, was too high for the cap-strapped Bruins to retain him. So they shipped him to the Calgary Flames. 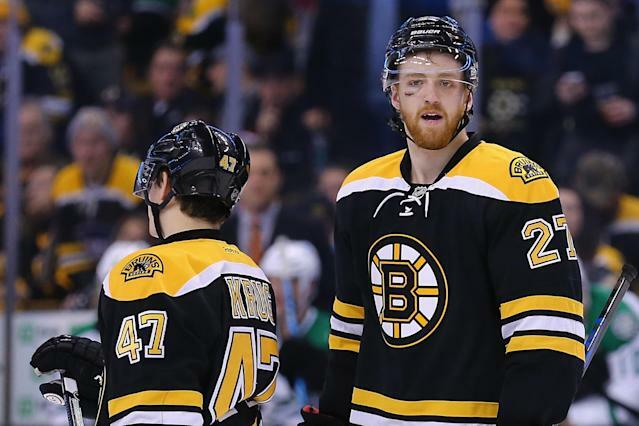 Now, true to form, there are anonymous sources explaining why it might be a good thing to clear Dougie Hamilton out of the Boston locker room. As it was, the Hamilton deal didn’t look good — but may have had a secondary cause. In that context, the deal makes more sense. Sources also said Hamilton exerted some control in the process, letting it be known which teams he would sign with and which he wouldn’t — maybe including Arizona, with which the B’s tried to trade up for the No. 3 pick. 1. The Bruins wanted to keep Hamilton. GM Don Sweeney said the team gave him “a significant offer.” He also said that Hamilton “had a real good year, a real breakout year offensively, and continues to round out his game both on and off the ice as a foundational-type player.” Please forgive us if any of this strikes you as “he was an uppity locker room cancer,” for it does not strike us that way. Perhaps Sweeney is just unaware. 3. Dougie Hamilton literally had no control in this process, other than setting the contractual price that whatever team retained his rights needed to match to retain his services. The Coyotes would have matched any and all offer sheets on him had they traded the THIRD PICK IN THE DRAFT for him. But then Calgary wouldn’t be the first team to benefit from a player shipped out of Boston for his “attitude,” would they?